What do Alexander the Great, Julius Cesar, Napoleon, Michaelangelo, Leonardo da Vinci, Beethoven, Benjamin Franklin, Mark Twain, Albert Einstein, Paul McCartney, Bruce Jenner, John McEnroe and former U.S. President Bill Clinton all have in common? You guessed it. They are all southpaws. In boxing a southpaw simply refers to a left handed fighter, one who fights with his right foot forward while holding his left rear power hand in the back for his lethal cross. The term “southpaw” has its origins from the baseball slang of the 1880’s. Baseball diamonds were often arranged so the batters would face east, to avoid looking into the afternoon sun. The pitcher's left hand, or paw, would therefore be on the southern side, hence the term “southpaw”. The idea the lefties are not all right has been around for centuries. Recently the Geschwind-Behan-Galaburda (GBG) Theory of Left-Handedness, presented in 1987, proposes that right-handed children have developed normally; they exhibit leftward symmetries in language areas. In contrast, left-handed children have suffered complications, which have led to anomalous cerebral dominance. Some researchers believe that unusual levels of testosterone during pregnancy cause left-handedness. Dr. Stanley Coren, author of The Left-Hander Syndrome states, “We believe that everyone was designed to be right-handed and that problems during pregnancy or delivery make someone left-handed. And these same problems can cause other problems.” Coren says such problems account for the high rates among left-handers of immune system disorders ranging from allergies to thyroid disorders. Prominent lefties with immune system problems include President George Bush, who has Grave's disease, and President Bill Clinton, who has many allergies. Dr. Coren has also found data suggesting that left-handers are five times as likely to die of accidents as right handers. Left-handers are also more likely to be dyslexic, schizophrenic, alcoholic, and delinquent. A 2004 study by Charlotte Fauriet and Michel Raymond of the University of Montpellier II in France, published in the Proceedings of the Royal Society, argues that there is a link between left-handedness and fighting. The researchers hypothesize that left-handed inheritance is likely to be associated with violence, because violent left-handed people would be more likely to benefit from the advantage in fighting. They found a positive correlation between murder rates and percentage of left-handed people in several traditional societies: The more left-handed people, the higher the homicide rate. The researchers argue that left-handed people are not more violent than right-handed people, but that violent left-handed people are more likely to be successful than violent right-handed people. In boxing being a southpaw is certainly an advantage. Southpaws are not feared because they are thought to be lepers with a contagious disease, or violent murderers like Jack the Ripper. No, they are feared because of their abnormal positioning against an orthodox right handed boxer. It is not easy dealing with a southpaw boxer as all of their punches come from opposite directions than what boxers are trained to expect. To a “normal” orthodox fighter, the southpaw’s attack just feels wrong. The jab comes from the “wrong” side, so does the hook and the rear cross. In the early history of boxing there were no southpaw fighters. Most of the great fighters of the 19th and early 20th centuries never faced a southpaw stance in their entire careers. It was considered an “incorrect” way to box, and inferior to the normal orthodox stance. Those who were born left handed were converted to the orthodox stance. This trend has continued to some degree even to this day. Some famous converted southpaws are James J. Corbett, who was know for his great left jab, as well as being the inventor of the left hook. According to historian Tracy Callis the turn of the century heavyweight champion Jim Jeffries, who was known for his great left hook to the body and head, was a converted southpaw. Carmen Basilio, welterweight and middleweight champion was a converted southpaw. Heavyweight contender Gerry Cooney was a converted southpaw known for his outstanding left hook. Amongst modern fighters Oscar Delahoya, although it is not well known, is a converted southpaw. Defeating a southpaw is not so simple as Tunney states if the southpaw has been well schooled in the fundamentals of boxing. It is true, as Tunney stated, that southpaws are susceptible to the lead right more than any other punch. This relates to maneuvering and staying outside of his lead foot. But there are many ways to defeat a straight lead right. One of the best methods is for the southpaw to utilize his lead right jab while moving to his right, this will keep his orthodox opponent occupied and off balance and unable to counter with his own right. If the southpaw is a counter puncher and he steps back the orthodox fighter is vulnerable to be countered inside of his lead right hand. Southpaws since there are fewer of them, are at an advantage; they are experienced against right handed fighters, but right handed fighters are inexperienced against them. When a right handed boxer is competing against a left handed boxer each fighters lead foot will almost be on top of the other persons. It is very awkward for the less experienced right handed fighter to face. His goal is to keep his lead left foot on the outside of the southpaw’s lead right foot. To see that southpaws are troublesome to orthodox boxers one doesn’t have to look too hard. In recent years southpaw Corrie Sanders knocked Wladimir Klitschko senseless with a left cross that Klitschko could not anticipate. Southpaw Antonio Tarver knocked out Roy Jones for the first time in his career with a punch that Jones did not see. Southpaws often blindside opponents because the power is coming from an unexpected place and from an unseen angle. That is why many really good southpaws have been highly avoided. One of the first southpaws on record was Mike Schreck, a heavyweight who fought from 1899-1916. He was considered very “awkward” but he lost to most of the top men he faced. Two of the earliest successful southpaws were Knockout Brown and George “KO” Chaney. They got their colorful names because of the large amount of knockouts they scored out of their southpaw stance. Brown was a lightweight who fought from 1908-1916 and scored 60 knockouts in his 93 wins. Chaney, who fought from 1910-1926, was a featherweight and lightweight who had 92 knockouts in his 137 wins. Their unusual punching angles allowed them to defeat all but the most elite fighters in most cases. However, these men and the other early southpaws like them, winged a lot with their punches, especially with their left, as Tunney noted. It was not until the coming of Lew Tendler that the southpaw fighter really began to receive respect. Lew Tendler was the first of the truly great southpaw fighters. Tendler is considered one of the greatest fighters to never win a title. He had a career record of 122-16-7 and fought from 1913-1928. He was highly avoided. He was not a devastating puncher but he could definitely put the hurt on you. What made him special was the fact that he threw perfect straight punches out of his southpaw stance and revolutionized boxing for the left handed fighter. In the rematch Benny Leonard had one year to prepare for Lew’s hard-hitting southpaw style. Leonard worked in circles around and toward the back of Tendler’s southpaw left so that Tendler was always shifting to get set again. He kept Tendler off balance and never let him get set to throw his power punches. Leonard won by a clear decision. The first southpaw-boxing champion was Al McCoy middleweight champion 1914-1917. He won the championship on a first round kayo of George Chip April 7, 1914 in Brooklyn, NY. He lost in a rematch to Chip on a decision the following year although he kept the title because championships could only change hands by a knockout in the No Decision era. McCoy eventually lost the title to Mike O'Dowd, November 5, 1917 on sixth round knockout. The great Harry Greb won and lost the middleweight championship to southpaws. He won the title Aug 31, 1923 from Johnny Wilson and lost it on a narrow decision to Tiger Flowers Aug 19, 1926. The next really good southpaw to arrive on the scene after Tendler was Freddie Miller. Miller was NBA and world featherweight boxing champion 1933-1936. Miller had 211 victories in his career, including winning 71 of his first 75 fights and is still considered one of the best southpaw boxers of all time. Eventually more southpaw champions rose through the ranks of pugilism men such as Lou Brouillard; welterweight champion 1931-1932, Juan Zurita; lightweight champion 1944-1945, Jimmy Carruthers; Bantamweight champion 1953-1954, Flash Elorde; Jr. Lightweight champion 1960-1964, Duilio Loi, 115-3-8, World Jr. Welter champion 1960-1962, 62-63; Flyweight champion Hiroyuki Eibihara who held the title 1963-1964, Vincente Salvidar, 37-3, Featherweight champion 1964-1970; (retires as champion) and Sandro Lopopolo Jr. Welterweight champion 1966-67. One of my favorite southpaw fighters was 3-time light-heavyweight champion Marvin Johnson, 43-6 (35). 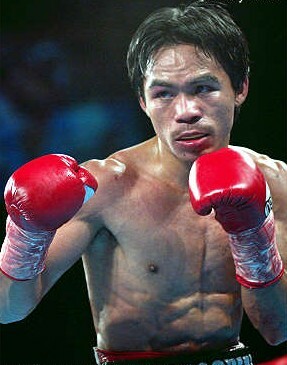 He was Light-heavyweight titlist WBC 1978-1979, WBA 1979-1980, and WBA 1986-1987. Johnson fought in an age of some really good light-heavyweights. He won his first title knocking out fellow southpaw Mate Parlov, his second destroying rugged Victor Galindez, and his third stopping Leslie Stewart. 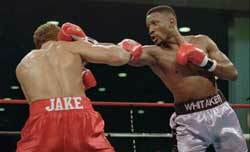 Johnson however, is most famous for his classic wars against Matthew Saad Muhammad. The fights against Muhammad were highly entertaining give and take fights with each man on the brink of destruction several times. He also fought and lost to Eddie Mustafa Muhammad and Mike Spinks. Johnson had a nice combination that he use to work; a right jab to the body, uppercut and hook all off the same lead hand. Johnson was a tremendous hitting southpaw puncher. The two best southpaw fighters of all time were Marvin Hagler, 62-3-2 (52) Middleweight Champion 1980-1987 and Pernell Whittaker 40-4-1 (17) Lightweight champion 1989-1991, Jr. Welterweight champion 1992, and Welterweight champion 1993-1997. Hagler had a strong shotgun jab and a crushing right hook from the southpaw stance, but lacked a huge left cross. Both Roberto Duran and Ray Leonard, the only men to go the distance with Hagler in championship fights, said that Hagler lacked power in his left. Whittaker had perhaps the best southpaw jab in boxing history and a solid perfectly thrown left cross, although he lacked real punching power. Upon reviewing the southpaw boxers of history we can say emphatically that there have been few truly great left handed fighters. None of the outstanding southpaws can be said to be truly "complete" fighters, although there have been a good score of quality champions. The southpaw fighter is still considered unorthodox, dangerous and to be avoided if possible. He does everything wrong, but he does get the job done right.